Nimm von uns, Herr, du treuer Gott (Take away from us, Lord, faithful God), BWV 101, is a church cantata by Johann Sebastian Bach. He composed the chorale cantata in Leipzig for the tenth Sunday after Trinity and first performed it on 13 August 1724. It is based on the hymn by Martin Moller (1584). 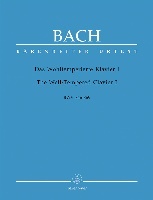 Bach composed the cantata in Leipzig for the tenth Sunday after Trinity as part of his second cantata cycle. The prescribed readings for the Sunday were from the First Epistle to the Corinthians, different gifts, but one spirit (1 Corinthians 12:1–11), and from the Gospel of Luke, Jesus announcing the destruction of Jerusalem and cleansing of the Temple (Luke 19:41–48). The text of the cantata is based on the seven stanzas of Martin Moller's chorale (1584), which he had written during a time of plague, as a paraphrase of the Latin poem Aufer immensam (1541). The chorale is sung on the melody of Martin Luther's "Vater unser im Himmelreich" on the Lord's Prayer. The words are used unchanged in movements 1 and 7. An unknown poet transcribed the ideas of stanzas 2, 4 and 6 to arias. He kept the text of stanzas 3 and 5, but interpolated it by recitative. The cantate text is only generally related to the readings, unlike Schauet doch und sehet, ob irgend ein Schmerz sei, BWV 46, a year before, dealing with the lament of Jerusalem in text from Lamentations. But the poet hinted at the destruction of Jerusalem by "Daß wir nicht durch sündlich Tun wie Jerusalem vergehen!" (so that, through sinful acts, we might not be destroyed like Jerusalem!) in movement 2. The chorale melody in Dorian mode is present in all movements but the first aria. The opening chorus is a chorale fantasia with the cantus firmus in the soprano, each line prepared by the lower voices. A choir of trombones plays colla parte with the voices, embedded in a setting of oboes and strings, which is also rather vocal. John Eliot Gardiner notes Bach's "disturbing intensification of harmony and vocal expression for the words 'für Seuchen, Feur und großem Leid' (contagion, fire and grievous pain) at the end of the movement". 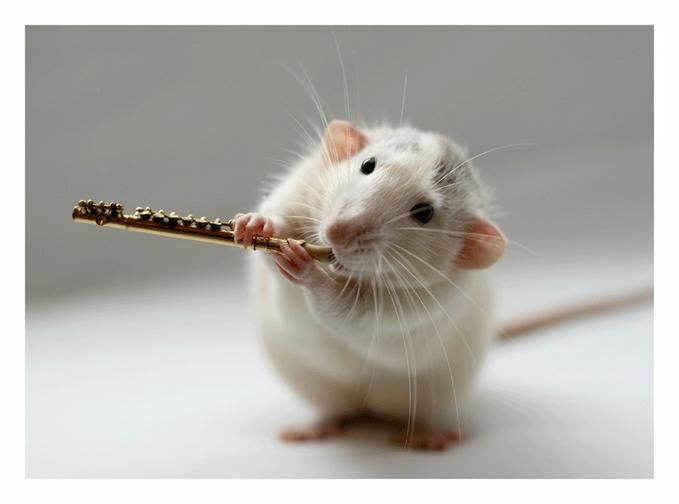 The first aria is accompanied by a virtuoso flute, replaced by a violin in a later version. 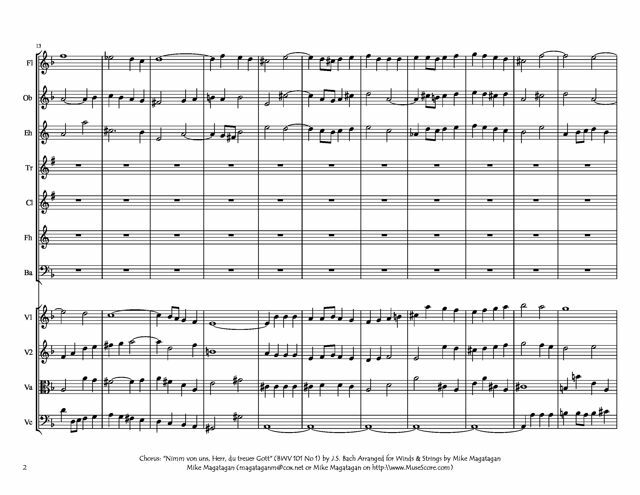 The flute writing suggests that Bach had a capable flute player at hand in 1724, as in Was frag ich nach der Welt, BWV 94, composed a week before. The recitative combines an embellished version of the chorale melody with secco recitative. The central movement starts like a dramatic aria, marked vivace, in three oboes and continuo. But after this "furious ritornello" the bass begins unexpectedly, marked andante, with the first line of the chorale stanza on the chorale melody, raising the question "why are you so incensed with us". In the middle section, the complete chorale is played by the instruments, while the voice sings independently. 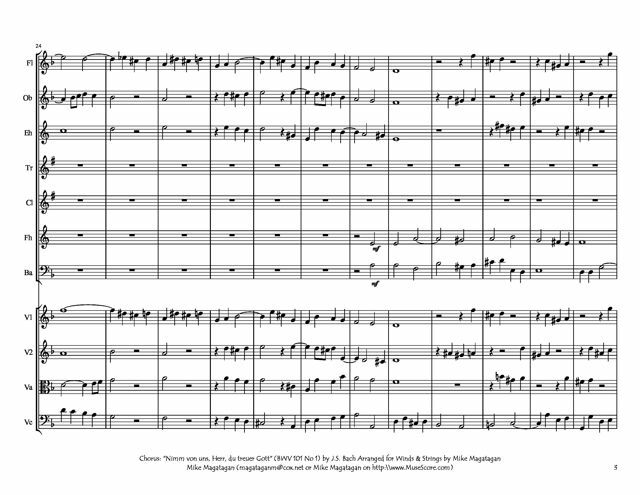 The cantata in seven movements is richly scored for four vocal soloists (soprano, alto, tenor, and bass), a four-part choir, cornett, three trombones, two oboes, taille (tenor oboe), flauto traverso (or violin), two violins, viola and basso continuo. 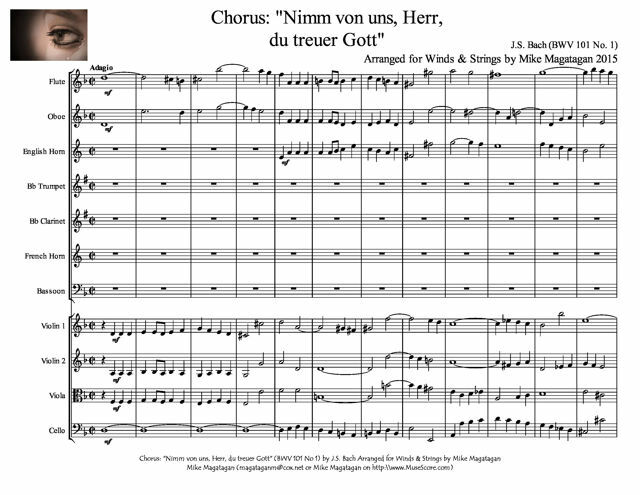 I created this arrangement of the opening Chorus: "Nimm von uns, Herr, du treuer Gott" (Take away from us, Lord, faithful God) for Winds (Flute, Oboe, English Horn, Bb Trumpet, Bb Clarinet, French Horn & Bassoon) and Strings (2 Violins, Viola & Cello).